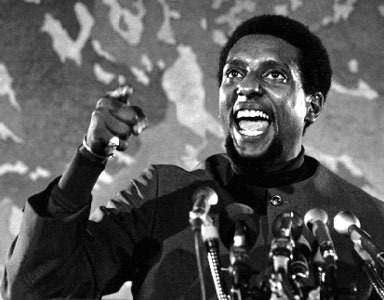 Stokely Carmichael was a pioneering Black activist of the Civil Rights Movement of the 1960s. He is primarily known for his affiliation with the Black Panthers. He was initially quite integrationist, but would eventually become a staunch pan-Africanist and Black Nationalist. He is responsible for coining two entirely different terms which combined explain why he holds a great deal of personal appeal. The first term is ‘institutional racism’, which I personally believe is the most powerful concept in gaining a true understanding of the racial systems that govern western society. You either understand it intuitively or it is completely invisible to you. It negates the false libertarian view of ‘pulling oneself up by the bootstraps’. It’s difficult to do so, when the very institutions of social, political and economic advancements are rigged against you. How can one play the game when the game is inherently unfair. The lack of understanding of this concept even to this day shows the lackadaisical attitude most majority groups have towards true societal equality. Carmichael understood quite clearly the forces both visible and invisible that were conspiring to prevent POC from reaching their true potential. On the other hand was the second term he coined: ‘Black Power’. This to me signifies the duality of Stokely Carmichael. While remaining cognizant of the power of the forces working against POC, he was forever mindful of the strength and ‘power’ that lay within. POC could achieve great things despite institutional racism. Black Power was to him “a call for black people in this country to unite, to recognize their heritage, to build a sense of community. It is a call for black people to define their own goals, to lead their own organizations”. He eschewed the middle class influences and instead focused on self-reliance. Carmichael was quite active in the freedom ride movement and spent numerous days in jail for his efforts. He would eventually join the Student Nonviolent Coordinating Committee (SNCC) and would later become its president, although he was never committed to strict non-violence as a matter of principle, viewing it rather more as a tactic. This was evident in his endorsement of the militant Activist group the Black Panthers. He would eventually settle in West Africa in a self-imposed exile and became more of a pan-Africanist. He would eventually die there at a far too young age. Carmichael was a strong and powerful voice who remains one of the greatest Civil Rights Activists of our time.